Ice diving is always something out of the ordinary. The atmosphere, colors, flora and fauna—it definitely pays off to endure the icy temperatures for a while. However, there are a few things you need to be aware of. If you are not afraid of the cold water and you can overcome the anxiety of diving under ice, you will enjoy photographing the sometimes bizarre formations under the ice. 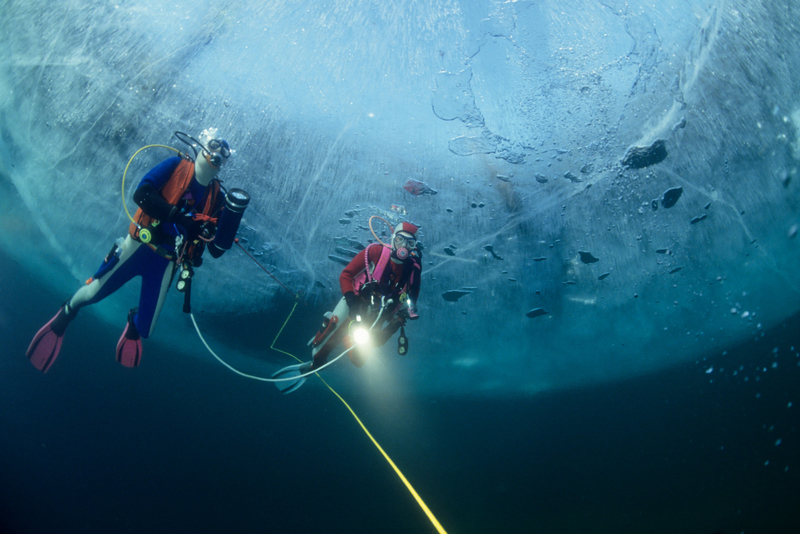 under ice is more risky than diving in open water. Even though you seldom dive very deeply under ice, but mostly keep directly under the ice, it is recommended that you take a special ice diving course before you go. In addition you need to have equipment that is prepared for low temperatures. The most spectacular images are often taken with rocky ice formations. These ice conditions arise when water is partly frozen, and the wind starts to shift the ice, so it piles up on each other. The temperature then drops low enough so that the ice forms fantastic structures. Combine this with sunlight, and you have some fantastic scenery for your photographs. Just make sure that (as with normal flat ice) the snow doesn’t cover the area where you want to photograph. As this will greatly diminish the sunlight. What kind of camera you use for ice diving doesn’t matter. More importantly are the batteries. These need to be new or fully charged, as extreme temperatures tend to deplete batteries more quickly. Whether you should use one or two strobes depends on how wide your lenses are—which can never get wide enough. And you certainly have enough free space under the ice to work with. You are not going to make any close up or detailed images under the ice. Here, we are literally speaking about the “big picture”. For example, pictures of your dive buddy swimming in diffuse light under the ice. Or images that capture the atmosphere of the light coming through the ice. For best results, mix strobe light with natural light. Set the camera on manual, set your focus on the immediate area in front of the camera for the flash, and regulate the shutter speed, so it takes into consideration the ambient light. The most ideal cameras for this kind of photography are digital cameras, as you can check the result immediately and make necessary corrections before the next shot. When using an analog camera, you should always make a series of images with different settings. Just remember to use fast shutter speeds as you would use in the Caribbean—this is easy to forget.